I won’t say ‘why you shouldn’t collect vintage Rolex watches’, because this post just reflects my opinion on collecting vintage Rolex watches. I am a huge fan of Rolex watches and have my share of them. My collection also includes a vintage ref.1600 Rolex Date-Just dating 1969 featuring a beautiful pie-pan’ish dial. A few years a go (+/- 2003), if you had 2500 Euro to spend, you could either choose a slightly used GMT-Master (II) or a vintage ref.1675 GMT-Master in good condition. Including the original box, if you were lucky. In the same period, you could have your vintage Submariner for a few hundreds extra. ref.1665 Rolex Sea-Dweller. Picture by OysterInfo.de. Since then, Rolex forums, portals and fan sites have been popping up like mushrooms, and boosted the vintage Rolex market. Even vintage Rolex watches in bad (or even worse) condition do not stay with the seller for a long time. Prices went up like crazy. A vintage ref.1675 in a so-so condition would easily fetch 4000 Euro. A vintage red printed Submariner? 8000 Euro. A ref.1665 Sea-Dweller from the late 1970s? 15.000 Euro! And I left out the double red printing on the last one, add another 10.000 Euro for the Sea-Dwellers with the red lettering. That’s how the market works I guess. And if you like vintage Rolex watches and have the money for it, buy now and don’t wait another 5 years. New Rolex watches also see their annual price increases, but not with the percentages of vintage ones. Undoubted, a modern Rolex watch is better than a vintage Rolex watch, in terms of quality of used materials and because of the movement. As for beauty, it’s a different issue. As I wrote before, I like the vintage Rolex watches, but the hype made the fun go away. A number of people seem to buy them to be able to show off to other vintage collectors, not for their own pleasure. It also occurred to me that most of the current vintage buyers are mostly focused on the optical aspects of a Rolex and do not care for its condition of the mechanical movement. That’s like buying an old-timer with a perfect paint job without popping the hood. Vintage Rolex watches in a good condition are expensive due to the demand, but asking (or paying!) crazy prices for watches in such a condition that the buyer should be lucky that it runs at all, is insane. I would be only interested in buying a vintage Rolex watch when it was in superb condition. Optical as well as technical, otherwise it is just an old watch to me. However, instead of paying 15.000 Euro for a vintage ref. 1665 Rolex Sea-Dweller, it also brings me – for example – an Audemars Piguet Royal Oak Jumbo ref.15200ST that is a few years old AND a brand new Rolex Sea-Dweller. Or, the summum of watch making, a Patek Philippe. In other words, if I would be in the market to spend 15.000 Euro on a wrist watch, it surely wouldn’t be a vintage Rolex. This entry was posted on March 5, 2008 at 1:00 pm and is filed under Discussion. You can follow any responses to this entry through the RSS 2.0 feed. You can leave a response, or trackback from your own site. Excellent article Robert-Jan and i couldn’t agree more. It’s like art… some ‘names’ become collectable and prices go skyhigh. Unfortunately this makes these watches unreachable for the true watch lover who admires a watch like this for ALL of it’s aspects, incluing what’s under the hood. Have an old rolex probably from the thirties still runs, I have pictures, serial numbers, model number, if your interested send me your email and I’ll show you. Hello. I have just acquired my grandfather’s gold oyster perpetual Rolex. I love it, and am BY NO MEANS any sort of watch expert, but as you all look like you might be! It was bought by my grandmother for him in the early 60s (my mom remembers the purchase of it new from a reputable Jewelry store back then.) The watch doesn’t seem to have any markings on the back of it. It is gold (my mom is a jeweler and tested it) -so maybe they have been worn down, but I’m not sure. Is this normal with an older watch like that? Is there anything else I should look for? There are only a few Rolex watches with markings on the caseback. The Oyster Perpetuals of the 1960s do not have any marking on the caseback. You might find the serialnumber between the lugs of the case. However, you have to remove the strap or bracelet for this first. Have this done by a watchmaker for you. The only Rolex with markings on the caseback is the Rolex Sea-Dweller sports watch in stainless steel. Stumbled across a ladies cocktail Rolex, probably made around 1936 if I’m understanding the serial # lookup correctly. I really know very little about watches although I love them, particularly vintage. Guy wants $1000 for it. Serial # 83856 14k. I guess it’s real although I’ve noticed ladies Rolex’s tend to be 18k that I’ve seen just browsing the internet. If anyone could help me out. Is this a fair price, bargain, or just plain silly? Mike Bubick I’d like to see the watch you are referring to. If you tell me you found it pinned behind some window curtains it’s a small world. Your watch is the one I’m curious about. I came across your blog while researching Rolexes. I know nothing about watches but am looking to buy an older Rolex from the 60s-70s period. One watch caught my attention today at a store – it’s a 1970’s stainless steel oyster precision with date. The salesman came down from $2,600 to $2,000 f after I pressed him a little, but I am still wondering if I am overpaying. One of the things that drew me to the watch was the dial but also the black leather band, which I find to be much more elegant and classy than the metal rolex band. I’m not a big fan of the Rolex band. However, I’ve noticed how much those bands sell for online – as much as $800 -and it occurred to me that this is where the retailers make their margin. Perhaps they buy the watch in full but then sell the band separately from the dial and wait for a person like me to buy the rolex with a much less expensive leather band because I like the way it looks. Am I on to something here? Watches always adds personality. Luxury watches can be acquired at great prices if you know where to look. Look for a wide range of Rolex Watches at substantial discounts and you won’t be disappointed. I am trying to research the year of manufacture of my 1600 Datejust. The bracelet is the 62510H. I think its a 1974 but was hoping you could confirm. It was my Fathers watch and besides the sentimental value, I think its one of the most beutiful timepieces I have ever known. I have the serial number if that makes a difference. Yes, interesting article and comments. I recently purchased a S/S 70s Rolex Oyster precision for about $700US which I thought was quite reasonable. The watch is in beautiful condition although the riveted bracelet appears to be a replacement and as I’m not a fan of metal bands I swapped it for a black leather strap. I assume Rolex bracelets have the Rolex logo on them and mine doesn’t. One of the things I enjoy about the older Rolex watches (apart from the price) is that they are often quite plain looking and in fact most people wouldn’t have any clue at all that the watch is actually a Rolex. In other words you can enjoy the watch for what it is (a beautifully fabricated and finished little machine) without appearing to be too either too flashy or brand conscious. I spent number of years and money trying to put a vintage collection together. Frankly it’s impossible given the number of watches in various shape. I tried to sell them and finally wound up with a couple of dealers I know. So for the past several years I wore my Oysterquartz, 17000 and the 1701400. It was only in the past two weeks did I purchase a Rolex Oyster perpetual. No date nothing fancy but the new dials they have been experiencing are quite different. Mine is black with an orange circle in the middle. I am satisfied with my purchased. My Oyster quartz are there if I want a change. Not all diamond jewelry stores are the same so check reviews first before buying on a jewelry store. Vintage Rolex is a very delicate matter and one should only buy from respected dealers, the Chinese have found out that forging vintage Rolex is a new way to make lots of money so the vintage market is flooded with fake vintage rolex watches, sold as genuine vintage watches, so be careful! I must say, vintage looks better than new, but you should be careful regarding authenticity and quality, it can also become a money pit. A little more hot air on a hot day in the desert of New Mexico, 104F. I just received, with in the past couple of weeks, my OysterQuartz ref 17014. That’s the OQ with the 18 k WG bezel. I had sent it to Dallas service center. True to their word it took four weeks. If I didn’t know better I’d be hard pressed to tell it from new. The total cost was $750.00 USD. My Rolex watchmaker could only adjust around the edges. Moral of this story, if you have an OQ and you and or your local watchmaker agree, ship it off to Rolex service. Don’t schlock around. I have a 1970’s Rolex Submariner w/ red “Submariner” I no longer have the box or papers. It was purchased in Switzerland. I have had it serviced regularly and after the last service 4 years ago, I learned that Rolex no longer supports this watch and replacement parts are not so easy to find. I stopped wearing it and bought a Breitling Navitimer. It keeps better time and has a mineral crystal which stands up to my abuse. Can anyone tell me approx. what my Rolex is worth? I am also a huge fan of Rolex watches. The things you have mentioned about Rolex are very true. I have recently purchased a Rolex 1970s ladies 14K yellow gold watch. The seller told me that it is quite common that ladies watches do not carry serial numbers. (There is Rolex markings in the inside of the case cover and the inside of the watch) As this is my first purchase of vintage ladies watch, I wonder if this is the case. I would really appreciate if anyone could tell me more info on this matter. I have also recently inherited a Rolex Orchid circa 1970s ladies cocktail 14K yellow bracelet Strap with diamond(26) bezel & 18K gold watch. There is Rolex markings in the inside of the case cover and some numbers at 12 oclock 2661 and at 3 o/clock 129. In addtion there are the hallmarks for 18K. The clasp is also marked for 14K. I would really appreciate if anyone could give me more info this watch and tell me whait it is worth. We are all in love with Rolex watches…….and the modern ones keep getting better and better. the new Sky Dweller is sure to become a big hit…..and you will be lucky to get one…even at $40k. The bracelets have gotten noticeiably better with the solid links and stronger clasp. But once you buy your first true vintage Rolex, you are done. 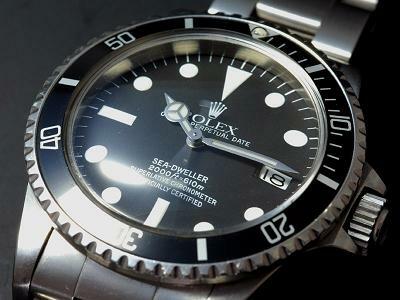 You could bump into 5 guys all wearing the same Rolex Submariner 16610 while at a high school basketball game. But how many will have a vintage Rolex 1680? You would be lucky if even one at the gane knew what it was. It is special. Like buying an old bottle of wine or an old painting. we sell new Rolex watches at http://www.bobswatches.com, and while we love them, it is the old collectibale ones that we have come to appreciate. happy hunting. One of the expensive collections that you can have is a vintage Rolex in your cabinet box. I know some places where you can find good-quality Rolex watches, and they sell Rolex in different designs and are all authentic. To make pay day loans and cash loan meet your needs, establish parameters for the loan. It’s not my first time to visit ths web page, i am visiting this website dailpy and take pleasant data from here everyday. event that you are great next some other is quite a bit beneficial along with exact same. and you will become significantly productive along with strong that will absolutely no perform won’t challenge people that you’re going to not make it happen operate. Paleo diet is the natural form of food. It comes directly from nature. grains. Also, all the modern fast foods and oily stuffs are out if Paleo Foods. Paleo Foods is what ancestors ate some 5000 years back. At that time was no agriculture then, so they ate direct from nature. from heart problem or diabetes likes sickness. You shall be strong and fit with very low fat in . You will feel full of stength & energy. I am not the greatest builder on the globe so I needed an excellent set of picnic dining room table plans and drawings. Wooden items, such as wood picnic tables, are ill-suited for latex paint. inches and be powered by a gas engine. Sometimes nasal snoring is caused by a deformity in the nose. irritation or allergy in the nose. You place the base of the tool on your chest bone and your chin on top of the platform. other financial obligation (no margin is required) until the foreign currency option is either offset or expires. Many individuals having double chins seem to be obese. 10 Creative Ways to Keep More of Your Hard-Earned Money. Real wood is a common material that people use for their decks. Nails alone are not enough to counteract the shear forces on a structural member. dancing. Venus in Aries sign is inauspicious in due to the owner of two marak sthan like dwiteye and saptmesh. Employee: On the way; it’ll take just a couple minutes. watch. Perfect if you want to be able to use the boat inside waters. Good respond in return of this issue with firm arguments and describing everything concerning that.